The difficult combination of structural sector headwinds, a slowing economy and a patchy consumer ultimately has meant that retail businesses in Australia have been forced to innovate to maintain an existence – either by evolving traditional business models or by including additional technology features to make products and services more accessible. The explosive growth of modern-day layby provider Afterpay Touch Group (APT) provides an interesting case in point, where retailers have embraced a service to provide consumers with flexibility of payments as a means to attract their custom. For those unfamiliar with the business, Afterpay has been an early innovator in the ‘buy now, pay later’ space where consumers are able to purchase goods in-store or online and subsequently pay off the purchase in 4 equal instalments over time. Unlike a traditional consumer loan business, the customer doesn’t incur any interest costs on the purchase amount (they can, however, incur late fees should they fail to repay the outstanding amount), with Afterpay instead deriving its revenues by charging the underlying retailer a small single-digit percentage of the total purchase cost of good acquired. Retailers have been increasingly keen to offer the service given access to the product has continued to show meaningful increases in both transaction sales volumes and average ticket sizes. In an increasingly competitive retail environment, Afterpay has ultimately provided retailers with one small weapon to drive sales to their store or website. The success of the business over a short time period has been well documented – at the time of the ASX listing of the business in March 2016 (which valued the company at a $165m market capitalisation), the business disclosed a little over 100 retail merchants that utilised the service and ~38,000 registered end-customers. Fast forward only 32 months later, the business now speaks for over 2.5m registered customers (greater than 10% of the Australian population) and is utilised by more than 20,000 separate retail partners. The business processes greater than 10% of all transactions conducted across Australian websites on any given day, with an additional instore presence in over 15,000 retail sites across the country. From an initial $165m market capitalisation, the company is now included in the S&P/ASX 200 index, with a market capitalisation of over $3bn. The catalyst for the ~45% decline since August has largely come as a result of the broader PE de-rate experienced by all higher growth / higher valuation businesses across the ASX in recent months (rather than any salient predictions of operational issues from the US rollout or impact from regulatory reviews on our behalf). Either way, the share price decline provided an opportunity to again redeploy capital into the same business we held in August at almost half the valuation. The success of the US rollout, in particular, has been nothing short of impressive, with over 450,000 end customers having now signed up for the service (including 19,000 customers that registered for Afterpay in one day alone over the Black Friday online sales event on November 23rd). Most encouraging to note has been the monthly rate of growth in customer sign-ups has been higher than the company’s original experience in Australia, with minimal execution issues yet to materialise. The clever consumer engagement strategy of asking millennial customers to hashtag their favourite retail brands on social media with requests to “Please add #afterpay” has subsequently gone viral, with a number of mid-size US retailers proudly announcing the inclusion of the service to meet their customers’ requests. Interestingly, this phenomenon has translated all the way to millennial royalty, with socialite power duo Chloe and Kim Kardashian also recently adding the Afterpay service to their respective retail brand offerings. Pleasingly for Afterpay, Kim Kardashian also felt it appropriate to highlight the addition of the service via her various social media feeds – including an announcement to her 59m Twitter followers and over 120m fans on Instagram. We have spent time in the US in recent weeks with a number of larger US-based retailers that have recently introduced the product, with the majority of early feedback echoing the now-standard trend of early enthusiasm and growing optimism. A US-based shoe retailer with over US$1.5bn in annual sales was particularly excited with the early traction of the service, noting that average basket size of consumers that utilised the offering was already trending higher. In one of the more impressive examples of rapid take up, the US head of e-commerce for apparel retailer Cotton On recently commented that, following the introduction of Afterpay in August this year, 20% of buyers were already utilising the service. With the US market well over 20x the size of the Australian opportunity, the potential for the business to grow significantly from here is obviously apparent. 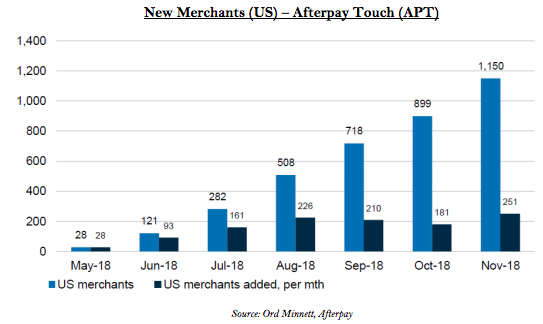 In a short period of time, Afterpay has scaled to 10% of all online transactions in Australia, representing an addressable market of ~US$18bn per annum. In the US, online transactions represent some ~US$450bn per annum, with online fashion alone accounting for US$60bn in purchases each year. We continue to like the business and continue to be excited to be a part of the growth trajectory from here. Quite agree Andrew - the recent drop in price has presented a welcome opportunity to top up on a business with global reach and good execution (recognising, with thanks, many professional investors paid a significant price premium over the current price to fund US and UK expansion [capital dilution in reverse? ]).